Countdown to London Marathon 2017 begins…. I then realised that even though I had put it out of my mind, I did really want to run the London Marathon. When I completed the ballot entry in April, I selected a series of charities that I was interested in; these were all children’s cancer charities, or charities focussed on blood cancers, as ballot week was also the week that a colleague’s son was diagnosed with Hodgkin Lymphoma. I sent off my details to several charities, and Children with Cancer called me up to offer me a place. I’m quite terrified and also quite determined that I will do this. 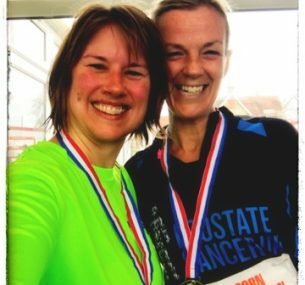 On Sunday, 19th February 2017, I ran my first ‘official’ half marathon. Despite having run the exact route the weekend before, I still had a sleepless night and ended up feeling really nervous! I met up with the rest of the Beginners2Runners crew who had entered, and also with Sarah Burden who I ran the Great South with and who is also training for the London Marathon for Prostate UK. 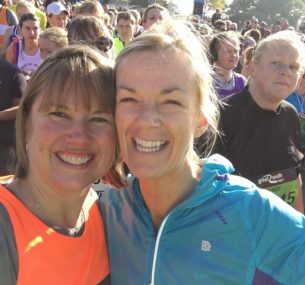 It was great to be out running with lots of people we knew, and the race conditions were pretty good – cool, breezy (ok sometimes too windy but better than being warm!) and a bit of steady drizzle to cool us all off. The whole route is very rural as we found last week, but there were water stations and a few hardy residents/spectators with tubs of jelly babies to hand out! The base was at the primary school so there were also plenty of decent facilities; bag drop, refreshments and the all-important loos! Sarah and I ran together all the way, and we saw my other B2R friends off and on throughout. We also had some extra encouragement from Dean who tweaked his cycle training route so that he could ride down and cycle alongside for a chat and general coaxing along, which was lovely! I took a few minutes off my time from previous week and Sarah beat her previous half PB by almost 10 minutes which is amazing! If you’d like to support Emma’s London Marathon run you can donate to her Virgin giving page.